Every morning I realize there is a long journey ahead to the reality of my dream. A dream that shows me the person I want to be in this world. But what I come across daily in this refugee camp makes me powerless. Life is relatively busy here. There is always something to be done. Like my employed fellow youths, I report to work throughout the week except on Sundays. I live in a small room made of twigs and roofed with sheeting popularly known as “UNHCR plastic” – a symbol that I am under the protection of the UN Refugee Agency. Breakfast is commonly known as “anjera”, a traditional Somali snack made from wheat flour. There is no Somali family in the camp that does not cook it for breakfast. I report to work at 8am. It only takes me about 15 minutes to walk there. I love my job because it involves young people. My responsibilities include coordinating the activities of all the organized youth groups and linking them with the aid agencies for “capacity building training”, facilitating some of the workshops, helping to produce the newsletter and organizing sports tournaments for calendar events like World Refugee Day. This helps the young get connected and shape their lives in a more productive way, despite the many challenges they face here. But it is difficult to gain the attention of some youngsters, who use illicit drugs to escape the bitter realities and lack of opportunity of camp life. Honestly speaking I have adapted to life in the camps because there is no other option. I see it as a city. [With about half a million residents, Dadaab is sometimes described as Kenya’s third-largest city.] After leaving the office I go to the market where business is booming. There are a lot of good places to visit and to meet my friends, take tea and discuss the news of the day. There are many tea shops in the market but the most popular one among the youth is the Halima Tea Shop, in the heart of Ifo camp’s market. We often pass time there as we sip milky tea and discuss resettlement issues, government work permits and Somali politics. On weekends, it is very busy and you will find much debate, mainly about the transitional government of Somalia. I don’t much like the politics but enjoy the healthy discussions because everyone involved has lived here for 20 years and we exchange ideas regardless of tribe or social background. Unlike some other tea shops, people don’t chew khat [a stimulant] at Halima’s. Quite a number of my friends are married with children. They tease me for not getting married but I insist the time is not yet right. 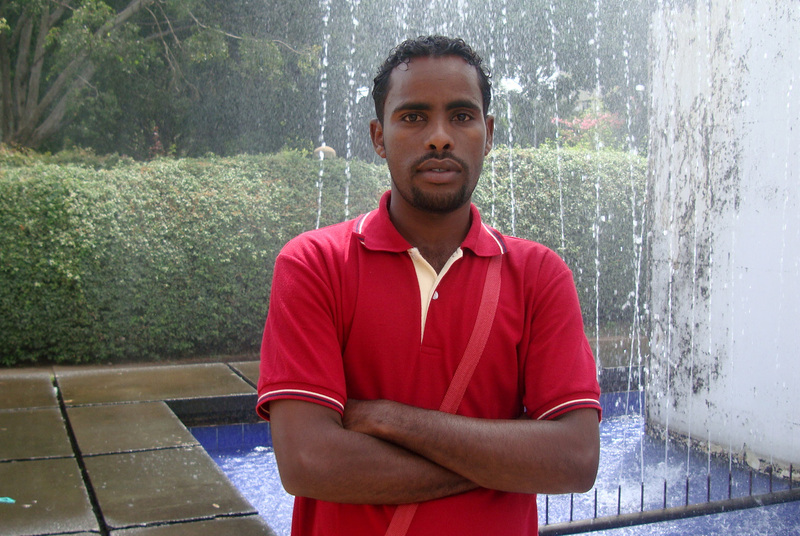 Abdi Nasir, one of my friends, recently got married through the support of a Turkish government aid agency. Abdi, who teaches at a madrassa [school], always wanted to marry the lady he loved a lot but could not afford to pay the dowry and wedding expenses. So the Turkish agency heard about his case and he and nine others were fully supported. After leaving the tea shop, I often go to the cyber café, which is again one of the things that help me forget the stress and suffering of being a refugee. I love it a lot because it helps me access the internet, read my emails and log on to Facebook where I update my status, connect to friends in the diaspora and follow the world from this remote area. I also update the page of the youth newsletter known as The Refugee, which is followed by people who were resettled abroad from Dadaab camps as well as some media organizations. We keep them up-to-date with the latest events here. Life is less fun after the sun sets. The market closes and people are not meant to move around. I visit my friend’s compound which has a television where I watch Al Jazeera, my favourite news station. This is only possible in the first four hours of the night because the commercial private generators are turned off at 10pm, so I go to bed then. My friend Aden, who is like a brother to me, jokes that “neither partying nor dating is possible here in the camps” but I believe that all will be possible when we go back to our motherland, Insha’Allah. I have won a scholarship through Somalia’s Transitional Federal Government to pursue a higher education. But the process is proving so complicated that I am almost tempted to withdraw. In the Dadaab refugee camps, every single step you take towards a better future seems to be a struggle of exhaustion but I try to keep moving forward. Since the scholarship results were announced in August this year, I have been going back and forth to Somali embassy in Nairobi. Recently I was told I would be studying in Khartoum and that although the scholarship would cover my tuition I would have to take care of my accommodation, meals and medical care myself. This was a nightmare for me. I could not believe my ears. There was something wrong. No one from Somalia’s Ministry of Education at the embassy was sure exactly what the Sudan government had to offer. Initially I thought I would be sent to a developed country with a full scholarship and a bright future, but what can I do now? When I came back to Dadaab two weeks ago with this sad news, I had nothing good to tell my fellow youths, who look up to me. They are also upset about the scholarship process. My hope lies with the Somali ambassador who has promised to do his best for us. If the Somali government or any well-wisher confirms that they will support me throughout my studies I will go ahead and take advantage of it but if I fail to get confirmed support, I am afraid to risk my life in an uncertain future. I will wait for another chance.